The largest single-day food drive in the United States – one which helps St. Mary’s Food Bank and other Arizona Food Banks stocked during the long, hot summer – turns 26 years old in 2018. On Saturday, May 12th, over 230,000 letter carriers nationwide, including over 5,000 here in the Valley will be picking up canned food donations on their regular mail routes during the 26th Annual National Association of Letter Carriers (NALC) “Stamp out Hunger” Food Drive. This drive began right here in Arizona more than 40 years ago. In 1976, Phoenix land Glendale letter carriers from NALC Branch 576 began picking up food donations in their own pickup trucks for St. Mary’s Food Bank. That soon evolved into a national effort that has collected more than a 1.5 billion pounds over the last 24 years for Americans suffering from food insecurity. A record total of 80 million pounds, the most food donations EVER in one day, was collected in 2016. Throughout the week leading up to the food drive, local letter carriers will be dropping off reminder post cards and special grocery bags to both city and rural residents’ mailboxes. 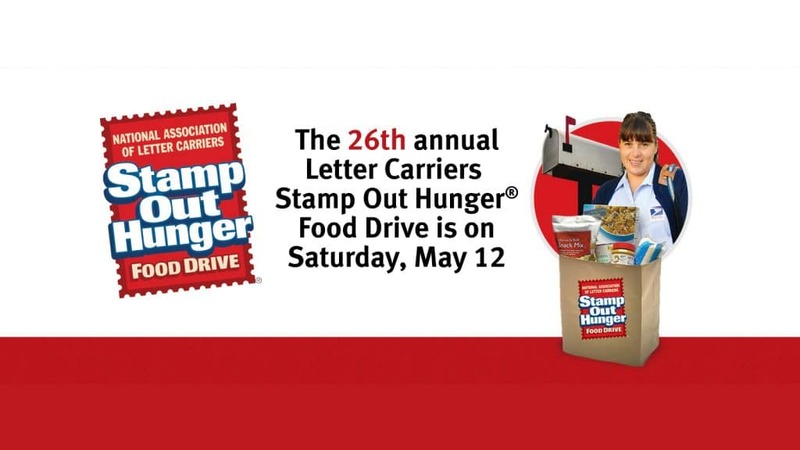 The letter carriers encourage those who can help to fill the bags, or any other grocery bag, with nonperishable food items and leave them by their mailboxes on the morning of Saturday May 12th. Your letter carrier will do the rest, making sure the food gets to the one in five Arizonans – and one in four children – dealing with hunger issues in our state. The hot summer months are almost here in Arizona. Food demand increases with children out of school, while donations dwindle with many residents escaping to cooler climates. With 24 percent of Arizona children living in poverty, and tough economic times challenging the community further, Arizona Food Banks rely on “Stamp Out Hunger” to provide that much-needed influx of food. St. Mary’s distributes more than 40,000 emergency food boxes each month, as well as stocking the 500-plus agency partners it serves. For more information on this event, visit www.helpstampouthunger.com. For statistics on poverty and hunger, media inquiries, photos or interview requests, please contact Jerry Brown at (602) 343-3160, (602) 684-0939 or jjbrown@firstfoodbank.org.